Agar-Agar Pandan or Coconut milk pandan flavored jelly is easily available at the cake shop or bakery in Singapore. You can see this in almost any ‘malay jamuan’ (party or special occasion) you attend in Singapore, and it is a really common yet popular dessert. 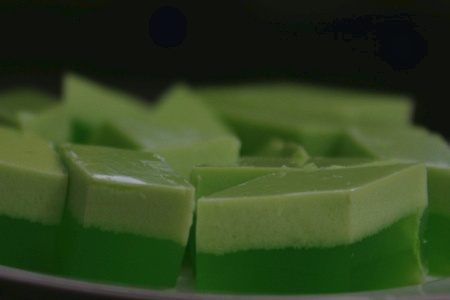 Agar-Agar Pandan is totally natural, even with pandan leaves (screwpine) as the natural colouring and essence. You should be able to buy the pandan leaves from some herb and spice shops, if you are not in Asia. 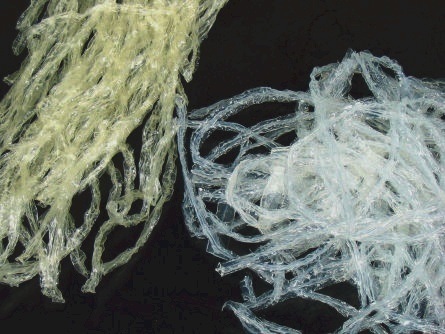 Available in powder and strip form (dried), agar is made from seaweed and does not have any calories. Suitable for vegetarians and vegans it is used as a setting agent for sweets. Flavourless it takes on the flavours it is mixed with and sets to a firm, pick-upable texture. Grind 3 pandan leaves and extract its juice through a strainer. Boil the water in a medium saucepan with the remaining pandan leaves. Add in the agar-agar and boil till it is all dissolved. Stir in the brown sugar and pandan extract, till all sugar is dissolved. Turn heat to low. Beat eggs in a large bowl, and mix it with coconut milk/cream with a pinch of salt. Pour the egg-coconut cream mixture into the saucepan with the agar-agar, stir well and let it simmer for a short while, then turn the heat off. Transfer the agar-agar mixture into your desired molds or containers. Chill it when cool and set before cutting into serving pieces. Any container can be used as a mold. You may use little cups, ice cream bowls, and ice trays with all kinds of shapes. You can adjust the texture by altering the amount of water – slightly more water for a softer texture, and less water for something more solid. If normal strip form agar-agar cannot be obtained, you can use powdered agar-agar too. The amount would be the same: 35 grams strip = 35 grams powder. wah..i didnt know this agar pandan is so easy to make! I would recommend having this during ramadan. Puasa dessert! How come mine didn’t work and turned out like tofu fa? =( Did i put in too much water? How many cups of water if i have only 10g agar?